= Nee, mayuge no kakikata, machigatte inai? = Hey, isn’t the way you draw your eyebrows wrong ? Today’s guest teacher is from Hokkaido. He taught you how to do 自己紹介(=jikoshoukai) the other day. Remember him? I don’t know what his real name is but since he has funny eyebrows let’s call him 眉先生 ( = Mayu Sensei) Eyebrows-Sensei. = Mayu-Sensei, please go ahead! Hello! I am your guest teacher again today and I am VERY happy to be back here. But why does Maggie keep calling me ” 眉先生 ( = Mayu Sensei) Eyebrow-Sensei“? What is wrong with my eyebrows? Wait! Do I have eyebrows??? Anyway, today‘s lesson is for beginners and we will learn how to use 方(=kata). = Kono geimu no asobikata wa fukuzatsuda. = The way you play this game is very complicated. = tegami no kakikata ga wakaranai. = Kono sofuto no tsukai kata ni tsuite kiite mo ii desu ka? = May I ask you how to use this software? やり方 ( = yarikata ) how to do something, the way you do something. = Shigoto no yarikata wo kaetai. = I would like to change the way I work. = Chounekutai no musubikata wo dare ka shitte imasuka? = Does anybody know how to tie a bow tie? = Kono kanji no yomikata wo oshiete kudasai. = Please tell me how to read this kanji. = Hashi no mochikata ga umaku natte kimashitane. = The way you use (hold) the chopsticks has gotten better, hasn’t it? = Kare ni deatte kara kangaekata ga kawarimashita. = Since I met him the way I think has changed. = Kani no jouzuna tabekata wo oshiete agemasu. = I will show you how to eat crab properly. = Nihongo no benkyou no shikata wo oshiete kudasai. = Please tell me how to study Japanese. 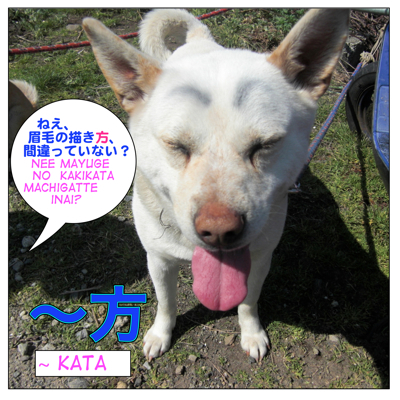 It is very useful to know how to use 方 ( = kata) when you are traveling in Japan,too. = Chikatetsu no norikata wo oshiete kudasai. = Can you tell me how to ride a subway? = Chiketto no kaikata wo oshiete itadakemasu ka? = Could you tell me how to buy tickets? = Yukata no kikata wo oshiete kudasai. = Please teach me how to put on a Yukata (casual summer kimono). = Roppongi (made) no ikikata wo oshiete kudasai. = Can you show me how to get to Roppongi? = Suica no chaaji no shikata ga wakarimasen. = I don’t know how to recharge a *Suica card? OK, that’s about it. I guess I’ll go remove my eyebrows. = Dareka mayupen de kaita mayuge no keshikata, shitteru? = Anybody knows how to remove pencil eyebrow makeup? = Mayu Sensei no oshiekata wa dou deshitaka? = How do you like the way Mayu Sensei teaches? = Mou “kata” no tsukaikata wa wakarimashitaka? = Now you know how to use “kata”? Sensei! What about the -no-kata usage like in ancient names in samurai dramas (Odai-no-kata, Oichi-no-kata)? Is that a suffix like -sama? Yes, の方 is an honorific expressions like sama. We stil use ~の方 to refer to a person. 待っていらっしゃる方 a person who has been waiting, etc. Can you explain the difference between 上手 (じょうず) which I was taught at school and 上手い (うまい) which I haven’t seen before? Other than that one is a na and one an i-adjective. It seems to me that うまい has wider uses, whereas じょうず only means ‘to be good at’, so would you tend to use うまい more commonly? 上手（じょうず）/ 上手（うま）い means “good at” / “to do something well”/ “skillful”/ to handle/manage something well” and they can be interchangeable in many sentences. Ex. She is good at cooking. I think your interpretation is right. There is a subtle nuance difference between jouzu and umai in certain cases. 上手（じょうず） might sound a bit condescending if you use it to someone professional or experienced. Maggie sensei ✋, is there a functional difference beyween using 方法(houhou) and 方( kata)? Thank you Maggie sensei for replying! referring to the previous comment, could you please explain the nuances of kara&dakara? I always thought Kara was a reason and Dakara is to describe the consequences. But we once came up with a tongue twister: kareshi wa karai karashi ga kirai kara, karai karashi wa kirei:) but the Japanese told us it had to be Dakara. I don’t get, we mention the reason why the musturd is good, why Dakara? Good question. I will post the question on FB sometime. 1) When they are used in the middle of the sentence. = Oishii kara takusan tabete shimau. = It is so delicious that I eat a lot. = Kore kara jukkiro hashiru kara gooru de matte ite kudasai. = 10 km hashitta kara tsukareta. = I ran 10 km so I am tired. = The library is so quiet that I can study well. = Ashita wa ame desu. Dakara tenisu wa shimasen. = It is going to rain tomorrow. That’s why (So) I won’t play tennis. Oh thank you!! it was so confusing..
OK, let me help your sentence first. You wanted to say “I hope my Japanese will improve”? You started the sentence with だから. だから means “that’s why” / “So..” and it has to explain what you mentioned in the previous sentence. とき is the most general one. ときは is used when you show the contrast. = When I was young, I used to listen to the song. = When we are young, we should do a lot of fun things. 車の運転ができる方= Kuruma no unten ga dekiru kata = A person (someone)who can drive a car. Ok, that 方=kata means “a person”. It is a polite way to refer to a (third) person.